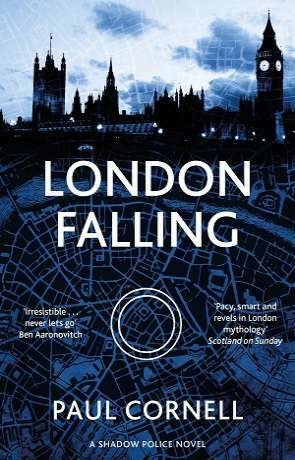 London Falling is the first in Paul Cornell's Shadow Police series. For those who don't know, Paul Cornell is an award winning author who writes across a variety of media and one of only two people to have been Hugo nominated for prose, TV and comics. He's also written a number of Doctor Who stories including the Tenth Doctor two-parter "Human Nature" and "The Family of Blood" which was nominated for a Hugo award in 2008. London Falling begins with Detective James Quill as he's about to complete the drug bust of his career. Then the prime suspect Rob Toshack is murdered while in police custody. To make matters worse, despite the suspect being killed in a police interview room there is no sign of the killer. As you can imagine Quill is not best pleased and ropes in under-cover cops Costain and Sefto along with intelligence analyst Lisa Ross to help solve the murder. It seems Toshack had employed some dark force to help him solve problems in his drugs empire - that is until his luck ran out. The suspect appears to be someone who can bend space and time along with altering the memories of those around her. Cornell writes dark and creepy stories without them descending too far into horror. The blend of police-procedural and dark fantasy works well, but does feel darker than most modern crime / urban fantasies - especially the later parts of the story. As you might imagine with this being the first in the series, the story does take a bit of time to really get going but it's worth the investment. Characters are interesting and varied, written in realistic shades of grey - although most aren't as likeable as they could be. The book has some great pop culture references and a dry, cynical humour while the way magic works is clever and different enough to stand out. The real star of the show is the big bad antagonist, stealing any scene they are in. Cornell does a wonderful job of creating the feeling that this small police team are entirely out of their depth and pretty much get beaten soundly at every encounter. By the end of the book the story and characters won me over and I am looking forward to reading more in the series. London Falling is a good start to a promising series, different enough to stand out from the crowd with a unique voice and entertaining story. Written on 17th July 2017 by Ant.